If you live or work in Baltimore, Washington DC or another major U.S. city you are probably all too familiar with the shared electric scooter or "e-scooter" phenomenon that has been sweeping across urban America in the last 2 years. In Baltimore, a fleet of hundreds of electric scooters just suddenly appeared all over the place downtown in the spring of 2018. Everywhere you went downtown there were rows of red and black Bird scooters lined up on street corners. Soon after more and more people were zipping around the sidewalks on the scooters. By the end of the summer, the green and white Lime-S scooters started popping up and seeing people zoom around on them was a common sight. Bird and Lime have emerged as the leaders of the new billion-dollar shared e-scooter industry. The e-scooter concept is pretty simple. If you want to use a scooter you just download the Bird or Lime app on your phone and create a rider account which is linked to a credit card. Once you have your account setup you just locate one of the hundreds of nearby e-scooters and use the app on your phone to activate the scooter and zip away. When you are done scooting you turn the scooter off with your phone app and simply leave it wherever you are. The charge for the ride (which is based on time and distance) gets billed to your credit card. Although e-scooters may be fun and convenient, they are potentially very dangerous both for riders and other pedestrians. Anyone who has shared a crowded sidewalk or intersection with someone on an e-scooter probably understands the potential danger pretty well. For starters, the e-scooters move surprisingly fast with a top speed of 15-17 mph. This is nearly 4 times the average walking speed, which makes collisions with pedestrians and/or fixed objects inevitable. This danger is further compounded by the fact that e-scooter riders tend to be younger and more aggressive/reckless. In most states, scooter riders don't have to wear helmets either, which increases the risk to themselves. Suppose an older person is walking around a blind corner in the city and gets struck by someone going 15 mph the opposite direction on a 30-pound metal scooter. Both the scooter rider and the elderly pedestrian are going to end up with some major injuries. Let's consider another likely scenario. Suppose a college kid is e-scooting around campus, looks away to say hello to a friend and hits a curb or mailbox. This sort of sudden impact with a fixed object could easily throw the scooter rider forward into the pavement and cause a traumatic brain injury. A number of studies and reports have come out recently which have attempted to quantify the occurrence and severity of scooter-related injuries. Scooter injuries are difficult to track after-the-fact because hospitals track the type of injury but not necessarily the cause. In January 2019 a JAMA Network study in 2 southern California hospital emergency rooms identified 249 patients admitted with e-scooter injuries over a 1-year period. The JAMA study concluded that e-scooter mishaps had a very high rate of significant injury due, in part, to lack of helmets and rider recklessness. 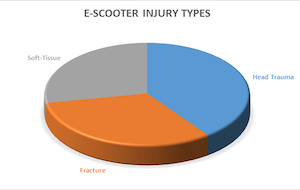 Head trauma was the most common e-scooter injury followed by bone fractures and soft tissue injuries. The proliferation of e-scooter accidents and related injuries to riders and pedestrians has invariably opened the door to lawsuits against the e-scooter companies. E-scooters are still a new thing so the law of e-scooter accident liability and insurance is still evolving. At this early stage of the game, however, e-scooter accident lawsuits do not appear to be very lucrative. For starters, e-scooter riders themselves agree to a liability waiver when they set up their user account. This basically means that if an e-scooter rider slams into a wall, gets hit by a car or gets injured in some other type of accident on the scooter they cannot sue the e-scooter company for damages. Even if the accident is caused by some problem with the scooter itself (e.g., brakes don't work), a rider may still have trouble holding the e-scooter company liable without evidence of "gross negligence." Even if a rider has a valid claim against an e-scooter company, the user agreement contains an arbitration clause. This means they would have to arbitrate their claim instead of suing in civil court. Mandatory arbitration would be an effective deterrent to all but the most serious claims. What about a pedestrian who gets hit and injured by someone on riding an e-scooter? Injured pedestrians haven't waived liability so they could theoretically sue the e-scooter company for damages. The problem with this is that the e-scooter company is not really the negligent party in the accident. The e-scooter company simply supplied the electric scooter device and had nothing to do with the accident. When you get in an auto accident you sue the other driver who caused the collision, not Toyota, Ford or GMC. The legal concept is applicable to e-scooter accidents. Injured pedestrians can definitely sue the scooter rider for negligent scooting, but they don't have a valid claim against the e-scooter company. The only exception to this might be if the accident was the result of some defect with the scooter (e.g., brake failure) that could be attributed to negligence maintenance by the scooter company. As explained above, if you get your leg broken by an e-scooter your recourse is a tort suit against the rider. In most cases, the scooter rider probably will be liable for the accident under negligence principles so you would probably win that lawsuit. The problem is that unless that scooter rider happens to have insurance coverage for the accident, you probably won't get any money even if you win your lawsuit. E-scooters have fairly small-sized electric engines so in almost all states liability insurance is not legally mandatory for e-scooters. This means that Bird and Lime-S do not carry any type of insurance coverage for riders of their scooters. Riders are not required to carry their own separate insurance and any exist policies they may have for auto, renters or homeowner coverage will not apply if they get in an accident on a scooter. The end result is that 90% of e-scooter accidents are not covered by any type of liability insurance whatsoever. With no insurance coverage to pay for damages, suing a negligent scooter rider for causing an accident will usually be pointless. Many people don't realize that if you win a lawsuit all you really get is "monetary judgment", which is basically a signed order from the court stating that the defendant owes $____ dollars. The court does not do anything at all to enforce the payment of that judgment. A monetary judgment against an individual defendant with no insurance is often difficult or impossible to collect on. Right now e-scooters can zip around town without insurance, but this might change soon. Various industry and special interest groups are currently lobbying state lawmakers to pass new rules requiring e-scooter companies to carry some type of liability coverage for people injured by scooter riders. A very similar lobbying effort prompted California and other states to pass similar laws requiring rideshare companies like Uber and Lyft to start carrying $1 million in liability coverage for passengers and other drivers. If efforts to force e-scooter companies to insure their riders succeed it will change the entire playing field when it comes to e-scooter accident liability. If scooter accidents are covered by insurance, it will likely result in a smaller scale version of the auto tort claims/litigation industry.